It's officially that time of year when nearly all our plans involve being outdoors. A rooftop yoga class? Yes, please. Happy hour after work? Only if we can score a scenic seat on a sunny patio. The same holds true for our own homes—we'd much rather dine, read, lounge, and do just about anything else outside, so it's time to give our outdoor spaces a little love. 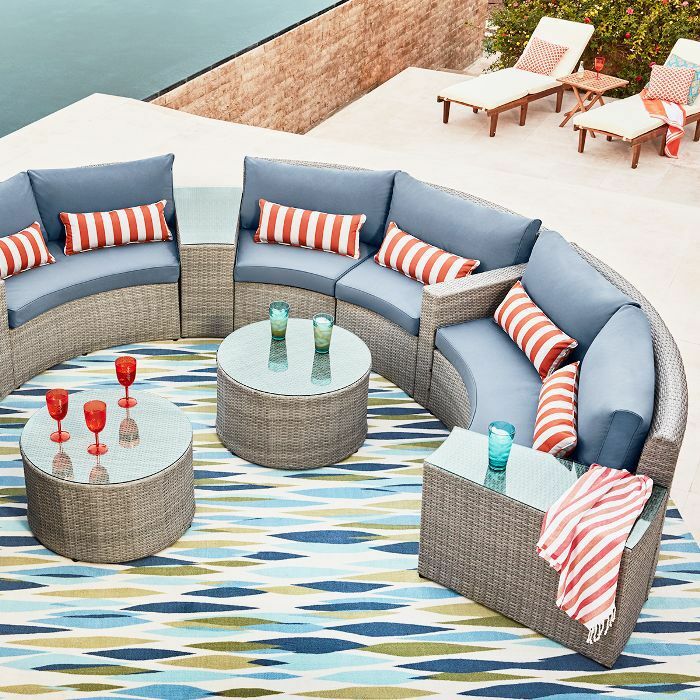 Whether we're working with a spacious backyard or a balcony just roomy enough for four, Overstock.com has all the stylish furniture and decorative pieces we'll need to create an outdoor oasis we'll be spending a lot of time in this summer. Ahead, shop our top picks to get started. Woven chairs of every iteration are a trend we're getting behind in a major way. They instantly transport us to our favorite tropical resort, but come winter, they'll look just as cool in our living rooms. A rug has the ability to tie together an entire space both indoors and out. We like oversize florals and leaf prints for the summer months. These silver pots are the perfect elevated outdoor accessory. We love filling them up with colorful flowers or low-maintenance cacti. Swapping out pillow covers is an easy way to spruce up our existing furniture. Ocean-inspired hues almost make it feel like we're relaxing at the beach. We can't wait to spend the day lounging on this rocking couch, ideally with a drink in one hand and a page-turning novel in the other. Whether we're serving up iced tea for two or piña coladas for a crowd, a bar cart is a must for summer barbecues. This adjustable umbrella comes in handy when we need a break from the heat but don't necessarily want to go indoors. Throwing an outdoor dinner party doesn't necessarily require a ton of space. These stylish foldable chairs are perfect for placing around a table on a smaller patio. Infuse some color by adding bright side tables. Is it just us, or does this marigold-yellow shade give off all those happy summer feelings? We love spending a cool summer evening outside, and string lights are essential for setting the mood. Want to see more stylish outdoor furniture and décor? Head to Overstock.com and start planning all those summer parties.